Sunday saw the 10th and final round of our Spring 2016 Junior Karting at Castle Combe Championship. We had 29 drivers competing and there was some great racing! Heading into the final 1st & 2nd place in the championship had already been decided. The 3rd & 4th were separated by just 1 point, with Harry Sadler needing to take the win in the final to take 3rd in the championship. It was Harry Sadler who lined up on pole position. He was joined on the front row by the man sitting 1 point ahead of him, Jacques Flanders. Josiah Lockett, the new champion, and Neo Mcbraida made up the second row of the grid, with Alex Mamuda 5th and Alex Cameron 6th. As the lights turned green it was Jacques Flanders who made the better start and he headed into the first corner fractionally ahead of Harry Sadler. He squeezed Harry right to the inside and they exited the first corner still side by side with Jacques just ahead but on the outside for the chicane. They went through the Chicane and Jacques was just able to slot his way through into 1st place, with Sadler having to back off and drop to 2nd, now under severe pressure from Josiah Lockett. Jacques was able to open up a bit of a lead while Harry Sadler defended 2nd place. Josiah was also under pressure from Neo Mcbraida in 4th, while Alex Cameron was just dropping away in 5th. Alex Mamuda lost a lot of time on the first lap and was trying to catch back up to the pack. As they entered the last lap Jacques had a comfortable lead, but Harry was still under severe pressure from Josiah, Josiah had a look up the inside into the top corner. There was a little bit of contact, Harry maintained the place but they both lost momentum, which brought Neo Mcbraida right into contention. He dived up the inside of Jos, there was contact and it caused Jos to spin. Neo backed off allowing Jos to carry on in front of him, but Alex Cameron came from nowhere to squeeze his way through into 3rd place, with Josiah rejoining right behind him. Jacques Flanders took the victory and with it 3rd place in the Championship, Harry Sadler was able to hang on to take 2nd place, while Alex Cameron took his best ever final result to finish on the podium in 3rd! Josiah Lockett took 4th, with Alex Mamuda able to pip Neo Mcbraida to 5th. The Fastest lap of the day went to Josiah Lockett, while the driver of the day award went to Bernie Mcbraida. Josiah Lockett was crowned as Champion, with Matthew baker 2nd, Jacques Flanders 3rd, Harry Sadler 4th, Alex Acton 5th and Jake Bishop 6th. The best Novice award went to William Jeary, who finished 11th in the overall championship and the Best female award went to Martha Hopes. Thank you to everyone who competed. We hope you all enjoyed the season. 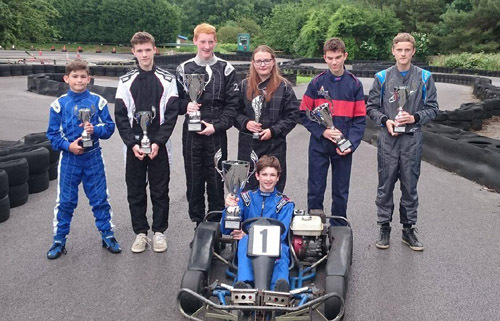 Our next event is the Parent Junior Karting at Castle Combe Races on Sunday 24th July, where the parents get a chance to show the kids how it’s done! Or more commonly the parents realise it’s much harder than it looks! We hope to see you then!